In flood risk prediction, accuracy is everything. Our cutting edge methodology sets a new benchmark in global flood mapping. Predicting areas at risk from flooding is incredibly challenging. Computer models must contain river channel size and location, estimates of flow and detailed terrain data in order to do a good job, and the cost of adding this fine detail is enormous. We’ve spent 15 years building the most efficient computer algorithms to make this possible at a fraction of the cost of previous methods. Fathom work at the forefront of academic research. Our extensive experience in building global flood models has given us an unrivalled level of expertise. Fathom was formed in the pioneering Hydrology Research Group at Bristol University, and our core computational engine is based upon methods pioneered by their award winning LISFLOOD-FP model. Our goal has been to transform this cutting-edge research into accessible tools that can be used by anyone. As a research-led company we believe that academic scrutiny is fundamental to better science and better products. Both our methodology and products have been critically tested and refined through academic peer review over the past 15 years, and published in the leading international scientific journals. Our methods have been developed in-house, giving us a unique level of flexibility and enabling us to meet the demands of diverse clients – from Insurance through to Conservation and International Development. As a result, our methods now underpin many industry models and represent a benchmark model for the UK Environment Agency. Achieving the highest quality terrain modelling is critical to building the most accurate global flood model. Working with leading scientist Dai Yamazaki, assistant Professor at the University of Tokyo, we have developed a terrain model with the highest possible vertical precision, essential for accurately predicting the flow of water. Since working as a post-doctoral researcher, Dai’s work has focused on the improvement of remotely sensed data for use in hydrodynamic modelling. The team at Fathom have continued to collaborate closely with Dai, gaining access to the very latest datasets from the academic world. Dai’s recent work - correcting data from existing global terrain datasets, has resulted in the most accurate picture we have of the Earths topography. This terrain data, or Digital Elevation Model, underpins the latest Global flood data produced by Fathom, resulting in the most accurate picture of flood risk available on a global scale. 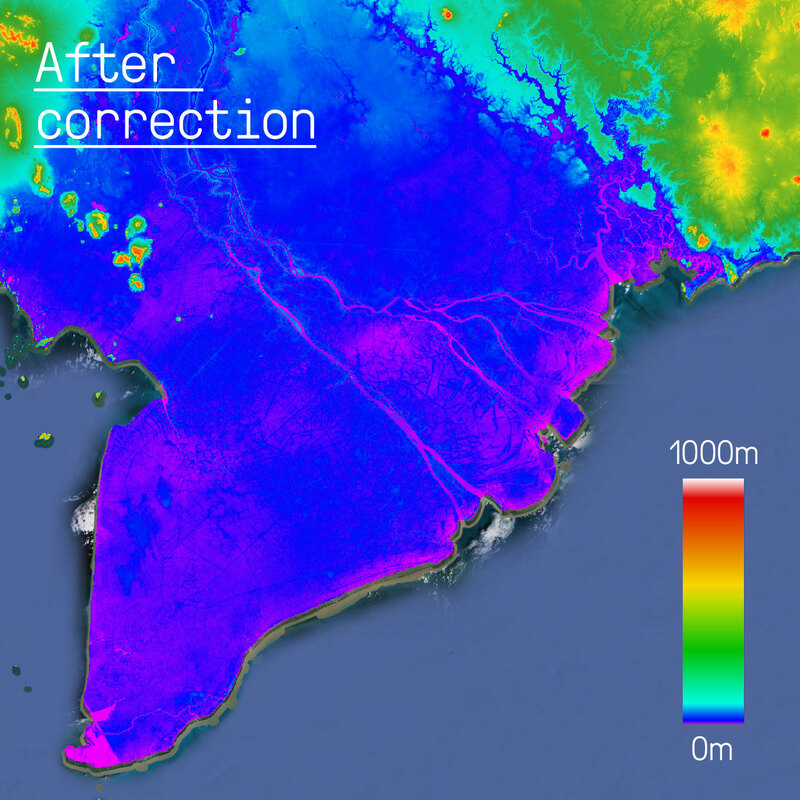 Our terrain model has been corrected as far as possible for the major sources of vertical error such as vegetation, built structures, spacecraft oscillation and instrument noise. We have separated absolute bias, urban bias, stripe noise, speckle noise and tree height bias using multiple satellite datasets and filtering techniques to create the most accurate map available. CLICK ON the map to see the corrected data. The breakthroughs we’ve made, in developing the most efficient computer algorithms have been so successful that our latest Fathom Global model can simulate the whole planet at 90m resolution. Our Fathom US Model achieves a resolution of 30m while our bespoke models can be as fine as 0.5m. Following the release of NASA's new state-of-the-art Digital Elevation Model (NASADEM) we will be increasing the resolution of the Fathom Global Model in 2018 to 30m. Through the development and refinement of new techniques we are continuously increasing the accuracy of our simulations. Our model structure moves away from ‘traditional’ rainfall-driven cascades. They can be unreliable due to the poor quality of globally observed rainfall datasets, so instead we use output from the Fathom Global Discharge Model (GDM). This model component uses a regional flood frequency analysis to generate flows, incorporating thousands of river gauging stations across the world. The pluvial (rainfall) simulations are driven by the Intensity-Duration-Frequency (IDF) relationships that have been derived globally. All simulations are dynamic full 2D simulations, undertaken using our bespoke hydraulic modelling package. And by constantly analysing real world events we validate our model’s predictions against recorded data. During the 2011 monsoon season in Thailand severe flooding spread through the provinces of northern, north eastern and central Thailand. In October, floodwaters inundated parts of the capital city of Bangkok. Sixty-five of Thailand’s seventy-seven provinces were declared flood disaster zones, and over 20,000 square kilometres (7,700 sq mi) of farmland was damaged. The World Bank has estimated 1,425 trillion baht (US$46.5 billion) in economic damages and losses due to flooding as of 1 December 2011. Seven major industrial estates were inundated in water up to 3 meters (10 feet) in depth during the floods. Disruptions to manufacturing supply chains affected regional automobile production and caused a global shortage of hard disk drives that lasted throughout 2012. The World Bank’s estimate for this disaster ranks it as the world’s fourth costliest disaster as of 2011. Our Fathom Global map prediction achieved a comparison hit rate of >85% with a Critical Success Index of 0.72 for this site.